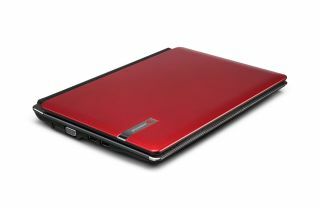 Packard Bell has announced it's upgrading the dot s netbook - with the snappily monikered dot s2. The new lap-warmer has a 10.1-inch screen, a 10-hour battery life, which PB is claiming means it's an ultra-portable, all-day netbook. To be fair, the dimensions do show something pretty teeny, with 258mm width and 185 mm height, and a hair over 25mm in depth, and only 1.25kg in weight with the 6-cell, 10-hour battery. There's an Intel Atom N450 processor powering things along under the hood, 250GB hard drive and both a five-in-one card reader and Adobe Photoshop Elements on board too. The 10.1-inch screen is backlit by low power LEDs, and PB states that the keyboard and the multi-touch trackpad offer accurate typing and enhanced mouseless action - although we'll wait for the review to believe that. Oh, and check out the colours on this puppy, in the words of Packard Bell: "The 'Cherry Red' means spontaneity, energy, passion; the 'NightSky Black' stands for classic elegance and standing; the 'Glacier White' tells a story of simplicity and perfection." The Packard Bell dot s2 netbook has got a UK release date for later this month, and will cost £299.99 with Windows 7 Starter Edition.